Barbeau Peak, the Highpoint of Nunavut and the Canadian arctic, was first climbed in 1967, and has been climbed only a few times since. Barbeau Peak is in Quttinirtaaq National Park on Ellesmere Island, a land of ultimate wilderness. Here the sun never sets during the brief arctic summer, and caribou and musk ox roam the frost-cracked tundra in search of low grass and willows. High above the icecap of Ellesmere Island, the Innuitian Mountains stand like icy watchtowers. Everything here reminds you that you are a long way from home. There is no good parallel to Barbeau Peak in the US. Summit day is a snow and ice climb that is easier than Mt. Hood. Since Ellesmere Island is an arctic desert, averaging only 6 centimeters of precipitation per year, weather is almost always good. Temperatures in summer are cool, but not unpleasant. The hardest part about climbing Barbeau Peak is getting there. First take a commercial flight from Ottawa to Iqaluit, and finally an ATR 42 to Resolute, Nunavut. These flights will cost $3,000-4,000. Resolute is the jumping off point for many high-arctic expeditions. A flight from Resolute to Ellesmere Island can be chartered with Kenn Borek Air. This charter has become very expensive since First Air stopped flying Twin Otters in 2002. The charter to Ellesmere Island now costs over $60,000 CAD, so it is critical to share the cost with others. A Twin Otter can carry up to 10-11 climbers, and the cost can be further mitigated by ride-share with other parties coming back or going up. Even so, the trip will be expensive. The best option is to land on the ice cap either north or south of Barbeau Peak. The summit can be climbed in a single day from the landing site. The peak is steeper on the south, but still not very difficult. Several different routes, ranging from 36 to 62 miles, are possible down the glaciers and across the tundra to Tanquary Fiord for the return flight to Resolute. 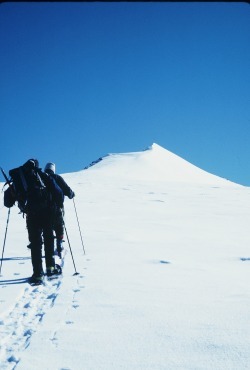 Travel down the glaciers is straightforward, and either snowshoes or skis can be used. There is little or no hazard from crevasses. Once off the glacier, the Air Force Valley is usually taken to Tanquary Fiord. Plan for 10-14 days on the ground in Ellesmere Island. The tundra is the most enjoyable part of the journey. Long-tailed jaegers may hover in front of you, while caribou approach closely, each curious of your presence. Musk ox encounters are not uncommon. Signs of men and women that have come before you are still clearly evident, even though some are nearly 4,000 years old. Ancient Inuit campsites and scattered remains of North Pole exploration parties speak of the courage and adventurous spirit of those who first came to this solitude at the top of the world.